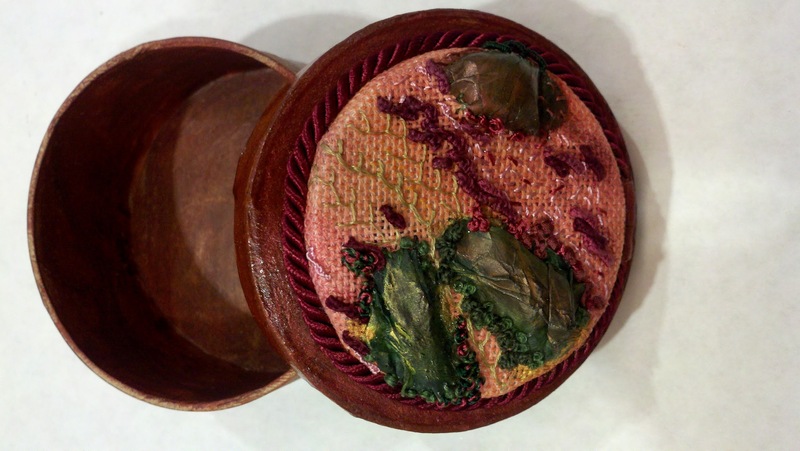 This year’s ANG Stitch of the Month (SOTM) from ANG is Feuilles d’ananas, by Susan Hoekstra (Pineapple Leaves) – A Study in Values. 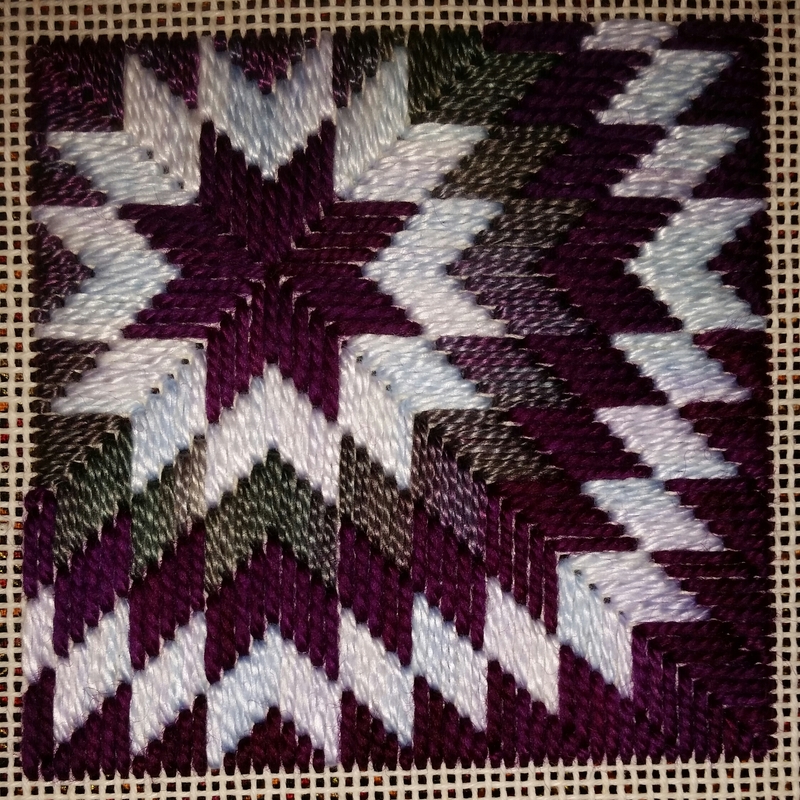 I was so tempted to do it in Susan’s colorway too (see it at http://needlepoint.org/StitchOfTheMonth/2016/SOTM201601_Introduction.pdf). But, as soon as I saw the materials list, I knew that there were plenty of skeins of Needlepoint Silk from Mae Van Damm’s stash in a wide range of scarlet reds. Sure enough, I had 5 values & enough to offer them to our members at ANG Main Line Stitcher’s chapter. So, I took them to Fireside Stitchery before our January meeting and found 6 Pepper Pot Silk colors and 2 Kreiniks to go with them (thanks to Linda for her assistance). I have them listed below. A couple of folks are going to do the piece in the reds. We all agreed it is a pretty design. 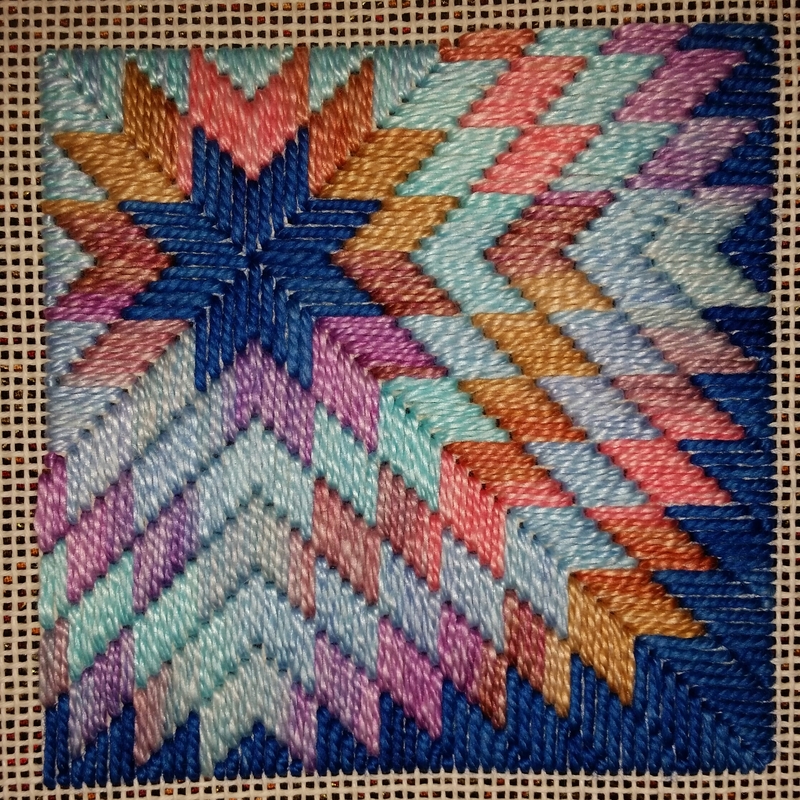 I had an easier way to stitch the 4-way Amadeus but glad I stitched it both ways. I could really see a difference! 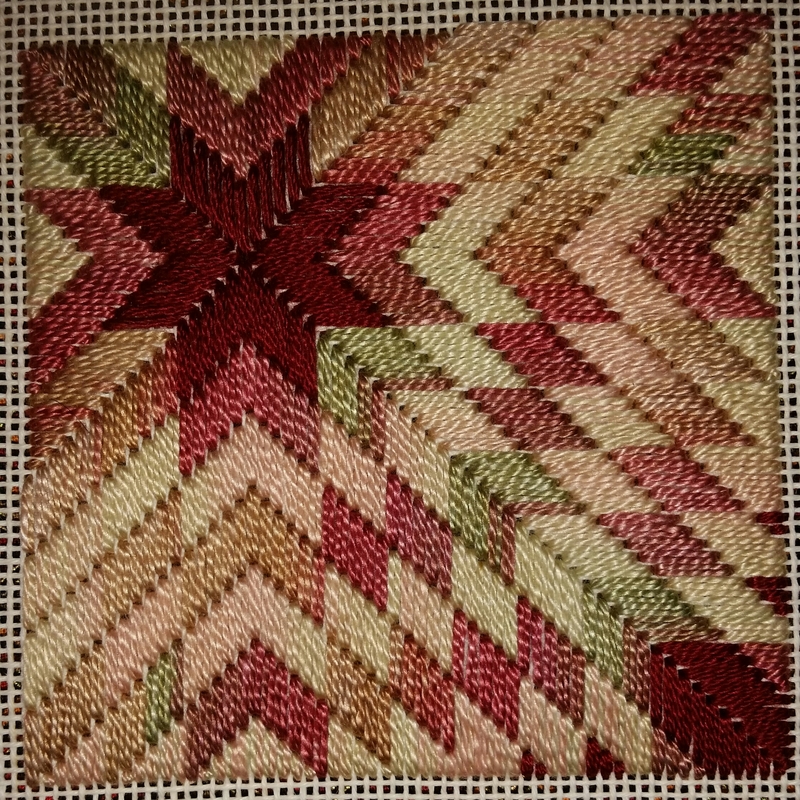 On the left, you see the easy way (stitch first the entire left side and then the entire right side) leaves a gap in the center which could be used if I went back and placed a thread or a bugle bead down the middle. But, I stitched it the way Susan charted it (one stitch on the left and matching stitch on the right with continued alternating sides one stitch at a time as it is built). And, the 4-Way Arrow Amadeus was done for the meeting too! I followed my 2015 mantra, VISION, by using some of what I had in my stash but I brought in more new pieces some of which were finished & others were added to my stash. But, I’m happy looking back at what was accomplished. I finished 13 projects including 4 of my own designs (2 are not going to be shown here until they appear somewhere else which is very exciting), 2 goldwork pieces (1 ANG seminar class project and 1 ANG Main Line Stitchers class project which were with great teachers and I learned a lot) & 7 charted designs. I finished Walking the Water’s Edge with just 12 hours left before we rang in 2016! That’s more pieces than I realized I had done. Not only did I enjoy stitching them but also learned a lot. Now, I am getting back to Spirit of Jean (hope to finish in Jan). And, I will spend time on another of my own designs and a small painted canvas. Since each one needs a particular mindset in order to do it correctly, I think I’ll go back to FOCUS as my stitching mantra in 2016. I think that has been a guiding principle since 2014 anyway. And, I don’t have to focus on the same piece every day until it is done. 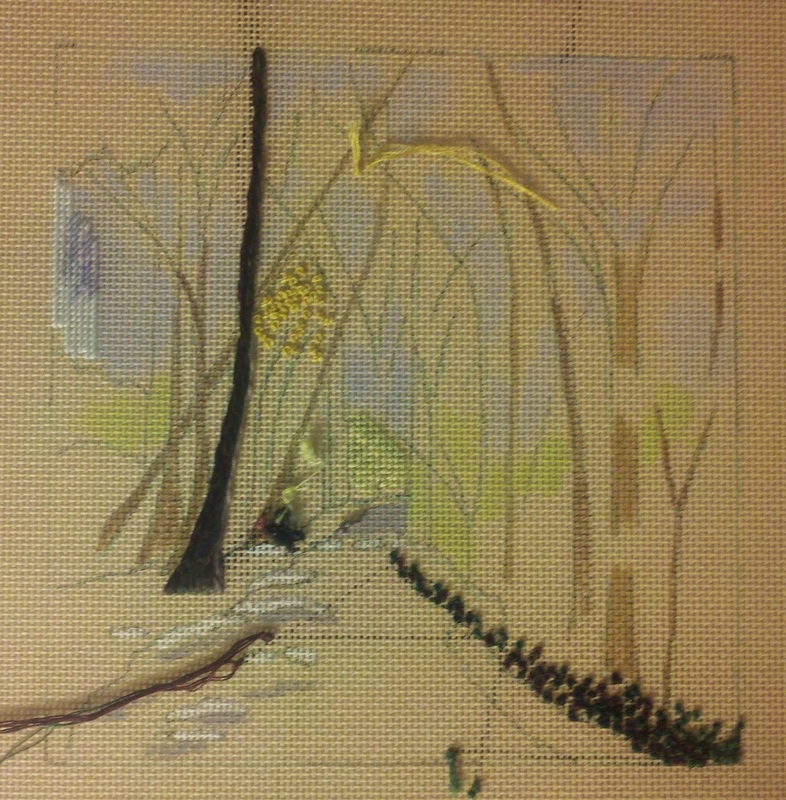 Rather, I look at focusing on finishing a particular section when I sit to stitch. That way I am accomplishing exactly what I want to do on a given day. I did have to rest my hands for a couple of days because I was getting quite a bit of pain from too much stitching. So I spent the time cleaning up my camera & computer folders. And, I see I have been remiss in posting various stitching related items. So, the next couple of weeks will be catching up – starting with scissors. If you don’t have the proper tools, stitching is more difficult. 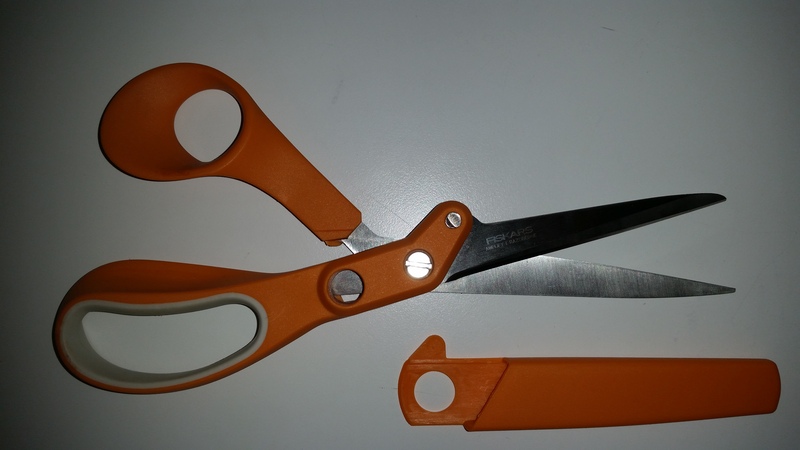 I’ve been using the Friskar scissors for a couple years now (since Marilyn O recommended them). And, I have given them as gifts. But, I love the curved Gingham scissors I picked up using part of the gift certificate I got this year from my ANG Main Line Stitchers chapter for my efforts on projects & newsletters. It feels safer clipping closer with the curved blade. Both scissors are so sharp.